In the world of motorcycles with plenteous electronics, high revving engines, bikes clocking speeds which were never thought of, the two-stroke oldies still have their massive fan base. These machines were all about the raw pleasure that one experiences as a result of simple combustion. Properly old-school, these motorcycles weren’t equipped with quick shifters or a complex fuel injection system. It was all about the mechanical sounds and the blue smoke from the exhaust that elevated motorcycles like the Yamaha RD350 into legendary space. One of the most in-demand motorcycles back then and even more so now, the Yamaha RD350 hid some notorious performance behind its simple appearance. 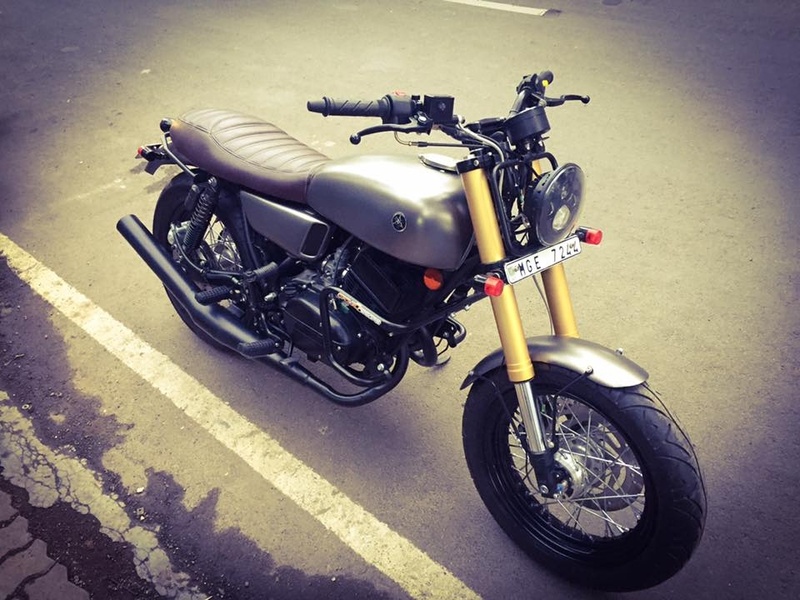 This particular example we’re featuring has been transformed by GroundDesigns – A Pune based all in one workshop. 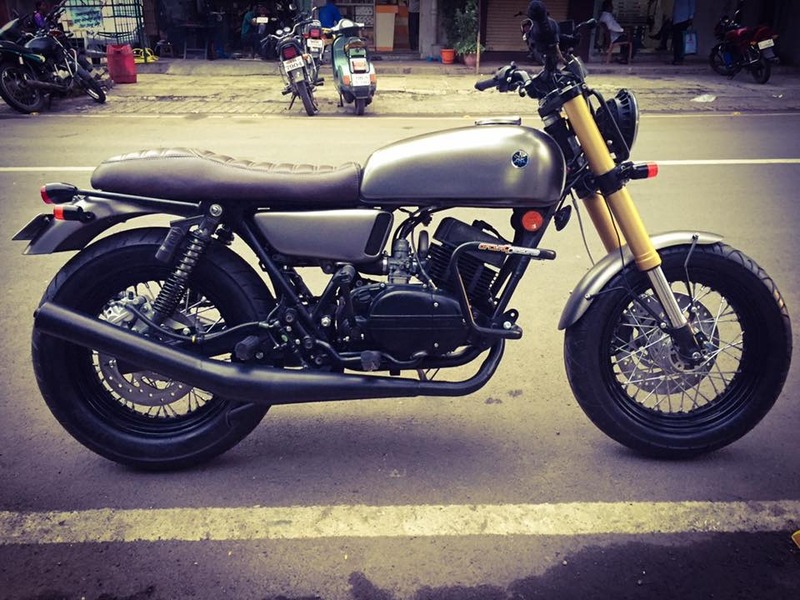 A transformation which has been tastily executed, this RD 350 wears a custom paint job and no decals anywhere except for the Yamaha logo on the sides of the fuel tank. To match all the hooliganism that mad parallel-twin spits out through those all-black custom pipes, traditional spoke-type wheels have been retained, however, some fat rubber adds more glue to this RD’s forward momentum. Everybody who has ridden one bone stock and even those who haven’t, know that the RD could scare with its acceleration. But what scared, even more, was the lack of braking force. So this example has gotten rid of the old drum brakes and gets discs at both ends. The conventional forks have been replaced with gold-finished USD kit which should lend the front with some more balance and stability. One of the many noticeable features is the aftermarket instrument console. 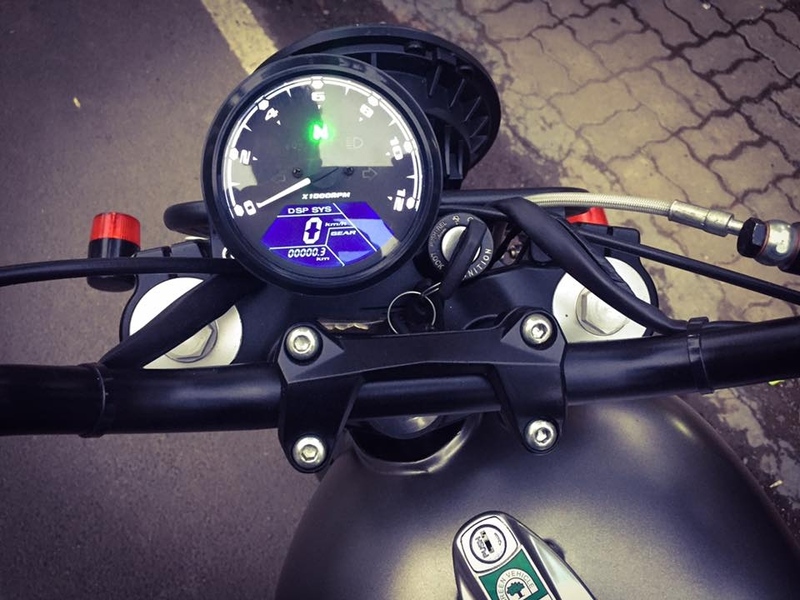 A semi-digital unit which has been positioned in an offset manner, it replaces the original twin-pod with an analogue tachometer and a digital display which tells the rider about the gear engaged, the speed and distance covered. Overall, we love the quilted saddle, the minimal panels and the simplicity in the paint job. For the uninitiated, which we’re sure not many exist when it comes to the RD350, this Yamaha was available in HT (High Torque) and LT (Low Torque) variants when it was on sale in India in the 80s. The HT was made between 1983 and 1985, and for a few years post that, even our government bought some. The engine for the India-spec bike was detuned to produce 30.5bhp from the original 39 bhp. This was achieved by restricting the exhaust port, which some owners figured out how to tinker with and release more horses. On the other hand, the LT version was restricted even further and its parallel-twin only could manage about 27 horses.